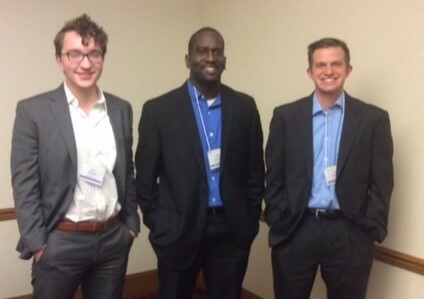 Dr. Colin Cannonier, assistant professor of economics, student from the Jack C. Massey College of Business Alex Marsh and alumnus John Sharpe recently presented multiple papers at the Missouri Valley of Economic Association (MVEA) 53rd Annual Conference in St. Louis. Marsh, an economics major and math minor, presented two papers titled “But Why Is The Rum Gone? An Estimation of the Price Elasticity of Demand for Wholesale Liquor in Iowa” and “Which Will It Be: The Empire Strikes Back or The Son of the Mask? Maximizing Movie Sequel Sales at the Box Office.” In the first paper, Marsh measured the price elasticity of demand for wholesale liquor in Iowa in 2015 which measures the response of consumers to changes in price of a good. Using regression analysis, the price elasticity of state-monopolized wholesale liquor ranged from -0.20 to -0.40, with most of the changes passed to consumers. He also found that previous liquor orders are good indicators of future orders. In the second paper, Marsh examined the factors associated with the release of movie sequels showing that film studios release sequels quicker the higher the profits of the previous movie. The most significant factor that influenced the timing was whether the sequel movie was produced by the same studio. Time between sequels increases by 60 percent when a different studio produces the movie. Similarly, time between sequels decreases by 25 percent if the previous movies were profitable. Cannonier and Sharpe, currently a PhD student at Vanderbilt, presented “Economic Growth in Transition Economies – The Role of the Great Recession.” In this paper, the authors investigated the effects of financial crises on growth in transition economies. Using the Great Recession as a plausibly exogenous shock, they employed a difference-in-differences econometric framework to investigate whether the event led to a decrease in growth in transition (former Soviet states and Central and Eastern European) economies relative to non-transition (and more developed European) economies. Compared to non-transition economies, their estimates suggest that the Great Recession reduced economic growth in transition economies by between 1.7 and 2.6 percentage points. Cannonier also presented a paper (co-authored with Dr. Monica Burke) titled “Tourism and Financial Development in Small States – Evidence from Caribbean Countries.” Tourism expenditure in Caribbean countries represents the single largest inflow of foreign exchange and is associated with significant international capital flow. Yet, the relationship between tourism and financial development has received scant attention in the academic literature. This research, focused on whether tourism promotes financial development in Caribbean economies, utilizes newly-constructed data on tourism flows to the region from 1980 to 2013. Using a variety of econometric techniques, findings revealed that tourist expenditure, on average, has a positive and significant impact on financial development measures. At the most conservative estimates, the authors found that by increasing tourism expenditures per capita by about $1,200, depth in the financial system improves by about 10-15 percent, while efficiency increases by about 57 percent. The Missouri Valley Economic Association (MVEA) was founded in 1963 to encourage the development of economics as a theoretical, applied discipline to foster communication among scholars in those fields and facilitate the extension and dissemination of knowledge. In pursuit of these goals, the MVEA holds an annual conference and publishes the Journal of Economics.